Hi, Foodie Friends. 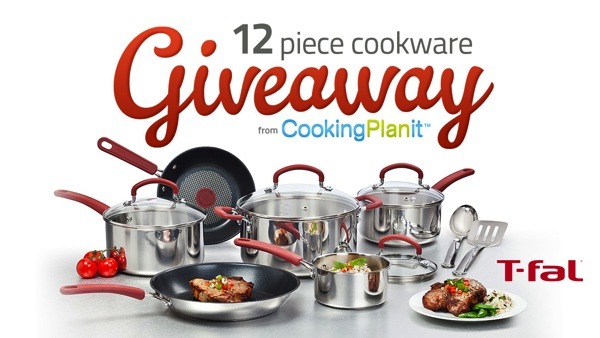 Wanted to give you a heads-up on a fabulous giveaway coming up from Cooking Planit. Some of you may have heard about Cooking Planit a few months ago when I worked with them on a sponsored spice set giveaway. This time I will be working with the meal-planning, video-guided cooking app and website on a giveaway for a set of Stainless Steel & Non-Stick Premium T-fal cookware. As with the spice giveaway, this contest has a total of 50 bloggers included, so you have plenty of opportunities to win. Here's a look at all the participating blogs. You can enter on each one, increasing your chances. Our contest kicks off on September 6, so look for more details in the coming days!